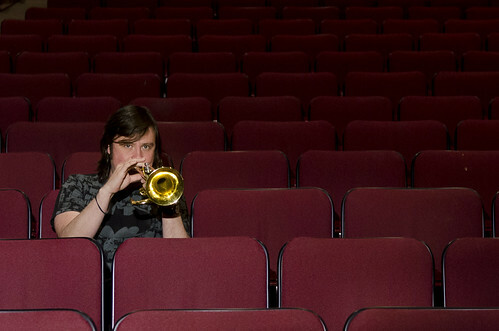 First seat trumpet, Jacob Nitsch, 28, warms up in the seats of McKenna theater before a rehearsal session of the San Francisco State University Wind Ensemble. Nitsch recently received a scholarship to study for his masters in music next fall. Photo by Gil Riego Jr.
Fifty musicians wielding saxophones, clarinets and bassoons bustled around the stage of McKenna Theater finding their places. Within a few minutes of beginning the concert, they were in perfect harmony, pumping out exuberant harmonies as their third concert of the semester began. This group is a very different from the SFSU Wind Ensemble that Martin H. Seggelke met on his first day of conducting them last semester. Since being hired, Seggelke has turned what had become a hobby for a few dedicated students back into a full-fledged class and performing group. The group’s current musicians hope to once again reach the high caliber they were known for prior to 2009, when budget cuts made it difficult for the department to hire and keep a conductor. After spending last semester recruiting members and regaining the quality expected of a university-level ensemble, Seggelke is now focusing on building connections. Their first concert of the semester featured musicians from Chabot College, marking SF State’s first ever wind ensemble collaboration. In March, the highly regarded Cal State Northridge Wind Ensemble visited campus for a concert collaboration, and on April 5 Analy High School shared the stage in a performance of Whitacre’s “Lux Aurumque.” Though Seggelke’s arrival to the department jumpstarted the ensemble’s outreach, his creation of the SFSU Wind Ensemble Council has effectively kept ownership and leadership of the ensemble in the hands of the students. From communicating with other schools’ music departments to program design, the work of the council makes the ensemble very much their own. “The main goal is to help with running the wind ensemble concerts, setting up the stage, working with ensembles that are coming in,” said Chad Goodman, a first-year graduate student and president of the council. Where Seggelke really comes in as the teacher of this group is in the music selection. While he commends the students who stuck with it over the past few years, he strives to increase the level of the music they learn, now that a curriculum is in place. The give and take between conductor and ensemble that is evident in their rehearsals also applies to the class curriculum. Seggelke gladly takes suggestions and picks pieces to maximize the educational experience. The step-by-step approach has worked so far for this ensemble, and Seggelke means to continue upward, inspired by the legacy of Edwin Kruth, who created and led the wind ensemble through the ‘60s and ‘70s. Senior and baritone saxophonist Joe Rieder began with the ensemble in 2006 when it was still strong, and stuck around through its initial decline. He has high hopes for the group’s future. The ensemble, which students and faculty of any department can audition for and participate in, will host its final performance of the semester May 8 in Knuth Hall. With plans to start touring in the fall, new musicians will be needed and anyone is welcome to audition.